Recently the children in Johnson House toddlers have been interested in discussing farm animals and the sounds they make. Throughout their learning the children have also begun discussing some jungle animals and the sounds they make. To follow and extend on the children’s interests we shared a discussion about jungle animals. As a provocation for our discussion, Cathy read two stories about jungle animals—‘Little Why’ and ‘Whose Stripes’. As we shared these stories, the children were naming the jungle animals and discussing the sounds they make. The children discussed how a tiger can ‘roar’, an elephant ‘stomp’ and a snake ‘hisses’. At the conclusion of the stories the children had the opportunity to make their own jungle animal sounds with the tapping sticks and they pretended to be jungle animals. As the children they engaged in these experiences, they continued to facilitate the development of their oral and receptive language skills, learn about jungle animals and what they look like and sound like, and share their own thoughts and ideas from the picture books as they pretended to be a jungle animal. 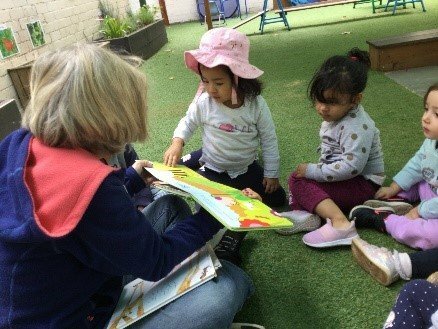 The children in Johnson House preschool have recently been involved in choosing provisions to engage with in the educational program. Being involved in selecting provisions helps children experience a sense of ownership and responsibility. 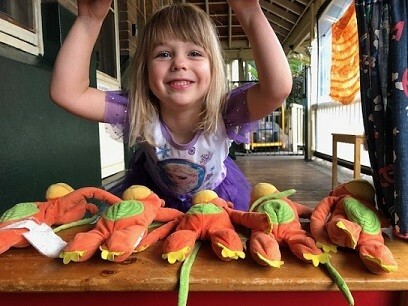 The puppets were a popular choice, and many children showed an interest in acting out familiar stories and songs such as ‘The Three Little Pigs‘ and ‘Five Cheeky Monkeys‘, while others collaborated with their peers to create stories and shows of their own. Creating stories and re-telling familiar ones builds on children’s language skills as they learn to communicate their ideas and to recall specific events and themes. The children showed great enjoyment in this experience, with many also demonstrating increased confidence and willingness to express ideas as the week progressed. 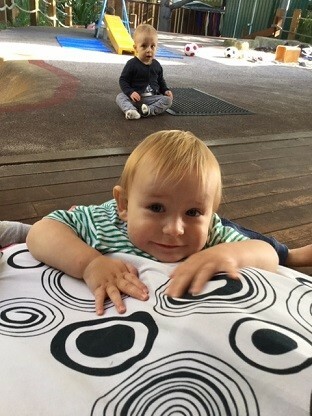 The infants in Murray House have been exploring many ways to play on the crash mat. Some of them have been showing an interest in jumping off the lounge and experiencing the sensation of their body ‘crashing’ onto a pile of soft foam cushions. 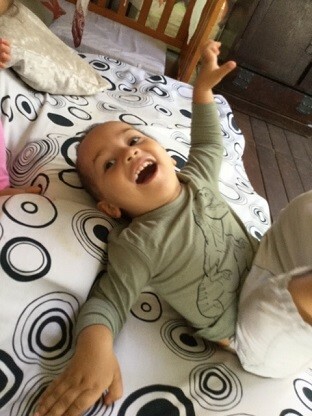 When children explore ‘jump and crash’ play, their muscles are stimulated and involved. From a sensory integration perspective, there are a lot of things going on at the same time, including pulling, dragging, lifting, pushing, and pressing, as they roll, tumble, bounce, climb, and practice other gross motor coordination. All of this large muscle work is great to build strength, increase muscle tone and body awareness. It also benefits the children’s sensory system due to its calming effect, which in turn helps to regulate their senses. A group of children in Murray House toddlers were observed playing in the block area. A child initiated to strike two pieces of block together, creating a rhythmic sound. Another child came to join her and began to sing ‘Taba Naba’. 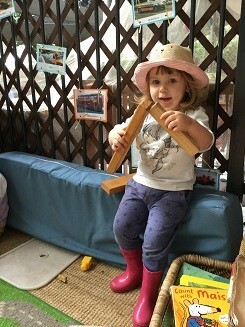 Her action inspired some other children to collect blocks and turn them into tapping sticks. They each took a cushion to sit on, forming a yarning circle. “Hey, do you want to come to Wangal land?” one child asked her friend. “Yeah! Let’s go to Wangal land!” They started singing “We live on Wangal land, we live on Wangal land…” It is lovely to observe that after weeks of a variety of experiences on Aboriginal perspectives, and through repetition and revisiting of these experiences, the children are developing an awareness of the Aboriginal land and culture. As they direct their own play, they demonstrate the ability to draw connections between experiences, transferring what they have learnt from educator-planned experiences on Aboriginal perspectives, and adapting it into their play. This week the children have been busy tending to the vegetable seedlings that they planted last week, and helping their educators with repotting plants. This was a lovely opportunity for the children to learn more about plants. Taking the plants out of their small pots allowed the children to see the roots of the plants. The educators reminded the children to handle the plants and the roots very gently, because the roots ‘drink’ the water, and help the plants to grow and stand up in the soil. It was lovely to see how gently the children cared for the plants. The children also established a small flower bed on the pathway leading to the front door of Rigby House. They take the responsibility of caring for our plants seriously, and each morning they ask for the watering cans to water the plants. 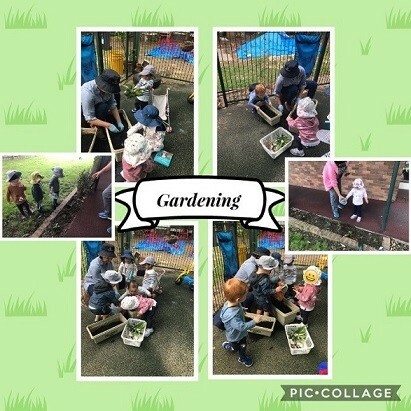 As the children care for the garden they have noticed the various bugs and insects which live there. Recently, they have become very interested in spiders and spider webs. 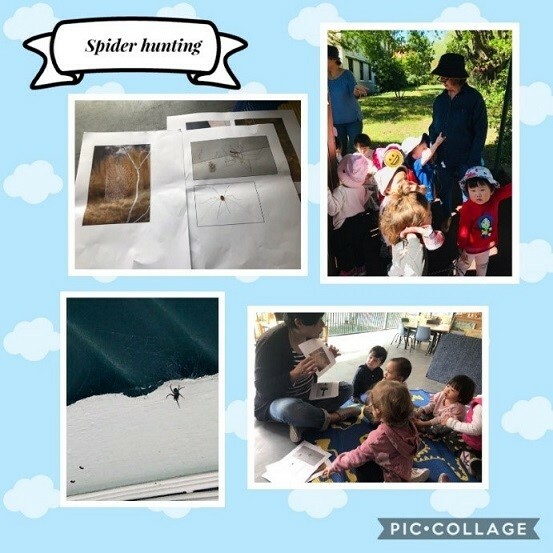 The children have learnt that you never touch a spider, but they are intrigued by how they can make webs and hang on them without falling. They now often ask to go on ‘spider hunts’, and enjoy spotting webs high up in the trees. Rigby House children are demonstrating growing appreciation and care for the natural environment, and they are developing their understanding of the interdependence between the land and all living things. The children at Jenny’s Family Day in St George have been growing ‘Luffa Cylindra’, which is also known as a sponge gourd, as once it has been dried it can be used as a scrubbing sponge. This is where the name ‘Loofah Sponge’ comes from. Gardening engages all of the senses—sight, hearing, taste (when safe and appropriate), smell and touch. 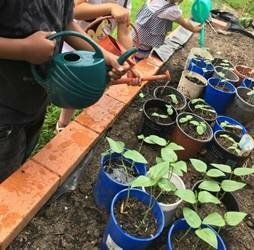 Gardening also encourages healthy eating as children are often proud and excited to eat and show their families the foods that they have grown. 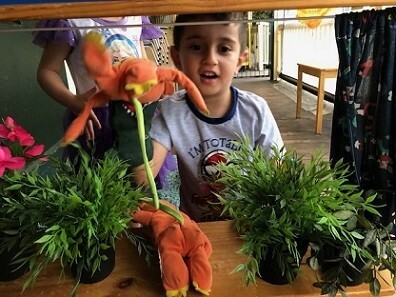 Scientific concepts have also been explored during this experience as children discussed things such as “What makes the leaves green?” Families have also enjoyed sharing children’s experiences and learning as they engaged in this project. The best part was being outdoors and digging in the soil—the children loved getting dirty.